Is your slow website hurting your business? Lacking a proper way of testing your website’s speed? Can’t find what’s slowing down your website? Having trouble starting your website’s optimization? 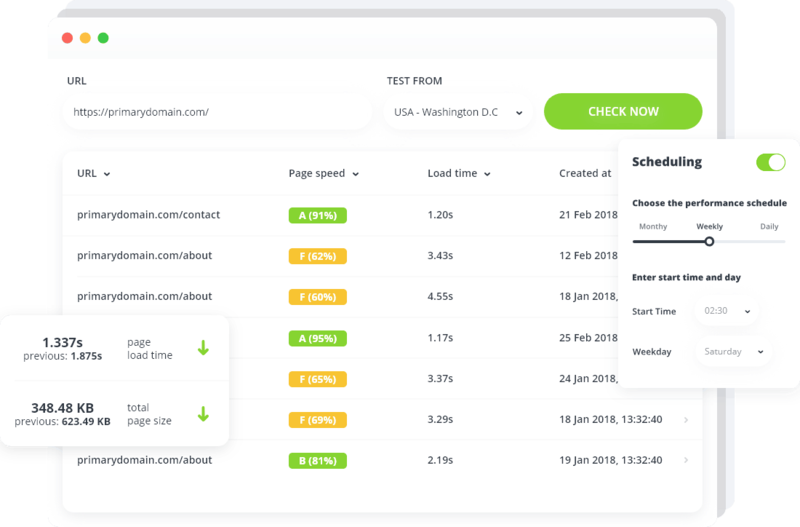 Check your site performance with just one click. A letter(A) grading system that shows how website speed ranks. See how long it takes for each page to load. Receive tips and suggestions to optimize your website’s speed. Compare the latest results of your performance check with the previous one. Schedule daily, weekly or monthly automatic performance checks. I always run a performance check before I make changes to my site. Useful tool. Wow, thanks! Didn't know my website could load this fast. Our construction company's website ranks much higher on Google. Great to know just what to fix to perform better. Sign up and speed up your website absolutely for free.